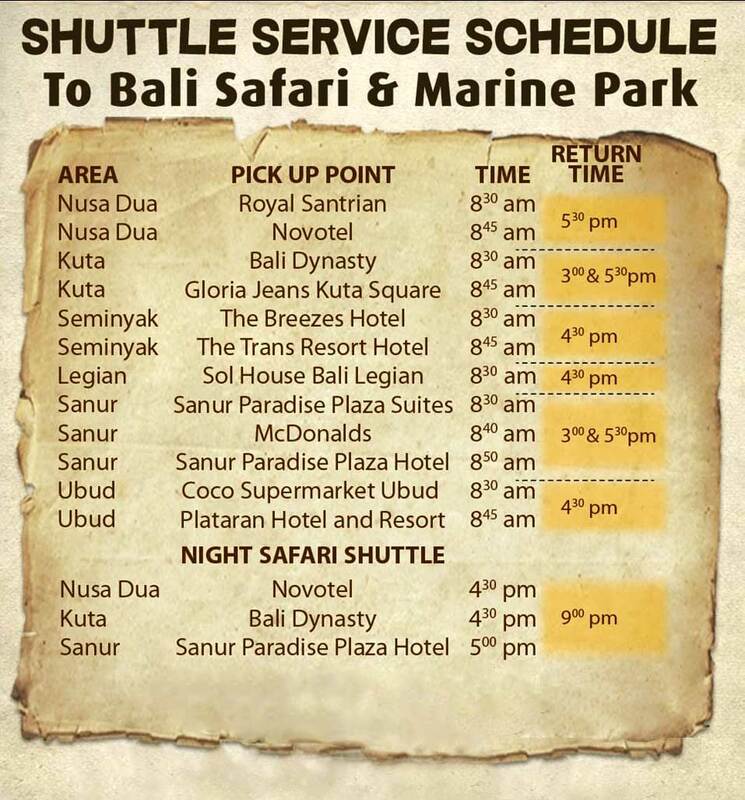 Our Big Discount at Bali Safari And Marine Park ! The advantages to use my private car is our Bali Driver also guide you to the park. Dragon Packages is one of Bali Safari and Marine Park packages offer the full day exploring the park with Safari Journey, Fresh Water Aquarium, Lunch at Uma Restaurant, Animal Show, Harimau Show, Elephant Show, Silver seat at Bali Agung Show, waterpark and fun zone. Elephant Back Safari is a guaranteed memorable experience, as the largest land mammal in the world takes you on an exhilarating journey around an African-themed environment. Immerse yourself in the beauty of our authentic setting and enjoy the opportunity of interacting with a number of other free-roaming African animals. Satisfy your senses with the unforgettable experience of a night time adventure in the wilderness. A specially designed caged tram will take you on a journey where you will get to witness and hand feed animals at a close range!